I love it! It’s a fresh, delicious, healthy way of eating. Especially for this veg-obsessed girl. … even if it’s kind of difficult to maintain sometimes. Ultimately, one of life’s mysteries is learning to balance and roll with the punches, and with that in mind, I’ve become more of a “flexitarian” in practice. Fish? Yes. Red meat? Rarely, unless it’s what THT cooks for dinner. Chicken? Samesies as red meat. Tofu? Awwww yeah. With those challenges in mind, I decided to try out an experiment: Could I make a hearty, tasty chili that incorporated my love of veggies, legumes and the like, while also keeping the dish hearty enough for my meat-loving fiance? 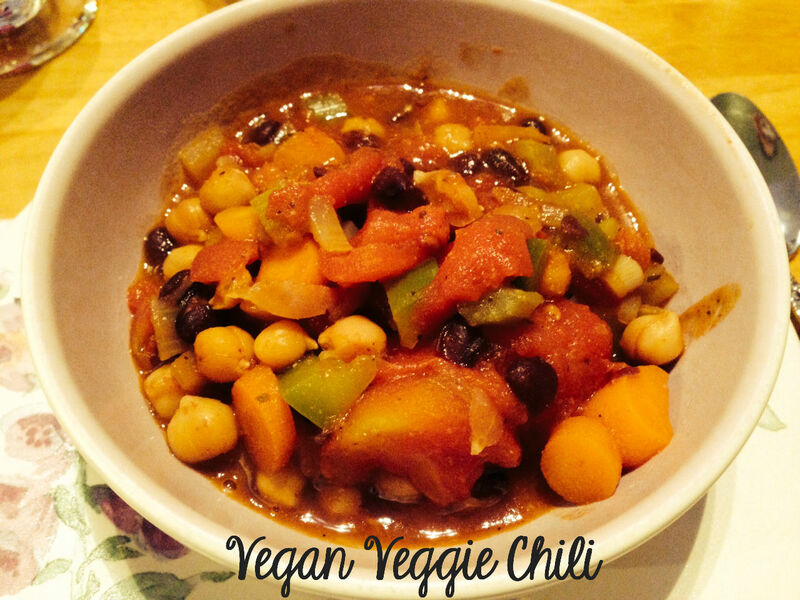 This Vegan Chili became vegan kind of by accident. As we were noshing on hefty bowls of it at supper, I realized that I could stamp this recipe with a notice: “No animals, nor any of their products, were remotely affected in any way by the cooking of this recipe.” Whether you’re vegan, vegetarian, pescatarian, flexitarian, or have no idea what any of those terms even mean, you’ll find something to like about a bowl full of this chili. Happy eating! In a large soup pot, stock pot or Dutch oven, head olive oil over medium heat. Add onions, carrots and celery; cook until softened, about 5-8 minutes. Add spices and stir thoroughly to incorporate (if you’d like your chili to have less heat, add spices with the beans). Stir in tomatoes; cook down for an additional 10 minutes, allowing the chili to thicken a bit. Add beans and additional veggies. Reduce heat to medium-low and cover; cook from 20 additional minutes or up to an hour. Just before serving, stir in frozen sweet corn. (The frozen corn will thaw almost immediately from the chili’s temperature.) Serve in hefty bowls with cheese and brown rice, if desired. 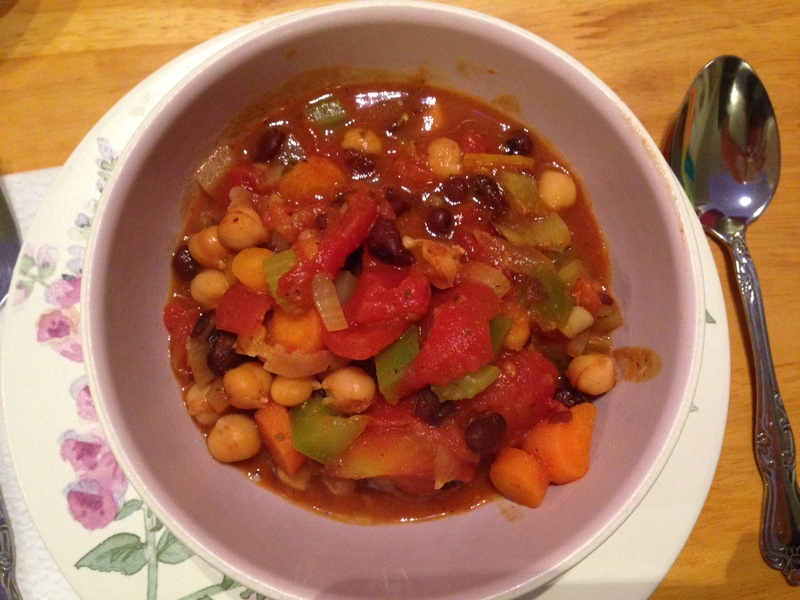 Do you folks ever whip up a vegan entree for supper? What are your favorite veg-friendly dishes? Ever use tofu, beans or other alternate sources of protein? Share away! P.S. If you’re interested in vegan or vegetarian dishes, try these recipes: Veggie pastas, this veggie torte, these veggie pizzas, and these veggie burgers.